"This has always been an often-requested recipe for its looks, taste, and no-plate finger food option. Enjoy!" In a mixing bowl, combine 2 cups coconut, sugar, flour, vanilla and egg whites; stir well. Divide mixture evenly among the prepared mini muffin cups, pressing mixture into bottom and up sides of muffin cups (use cooking spray on hands to prevent the mixture from sticking to your hands). Prepare lemon pudding mix according to package instructions. Spoon lemon mixture into each macaroon tartlet shell. Top with 2 teaspoons of whipped topping sprinkled with 1/2 teaspoon coconut. 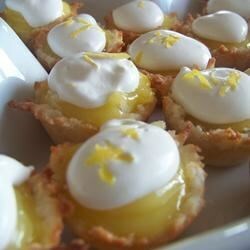 These impressive little lemon-curd tarts are surprisingly simple to make. No problems w the curd. Could not get the macaroons to mold into cups. This rating is for the shells only. Easy and very good filled with the Lemon Curd by Margaret on this site. These look professionally made, and someone said they were the best things he'd ever tasted. Keep an eye on the macaroon shells when baking. The lemon and coconut go very well together. These are perfect for parties, nice presentation and very tasty.